It's only my second product from Laura Mercier (with a 3rd currently on its way to me - Indiscretion Highlighter anyone??) and I am already in love with everything I own - it is such a shame my nearest counter in over 4 hours away *cries* so I can't just go on a swatching mission whenever I like!! The Flawless Contouring Palette is limited edition (LE) and as soon as I saw pictures popping up on social media, I knew I had to have it!! I called up my nearest LM counter (Brisbane, Queen St Mall) and spoke with the counter manager Mary, she was so lovely and said she would call when they arrived in store! Little did she know the stock would arrive earlier than the original release date, and she called me the very next day!! She shipped it out free of charge and it arrived 2 days later!! This is my first "real" contouring kit - the Australis one I have doesn't count because I think its terrible (my own opinion - you may love it) and I firmly believe in the saying "You get what you pay for!" This contour palette retails for $69.00AUD and I believe it is very well priced! 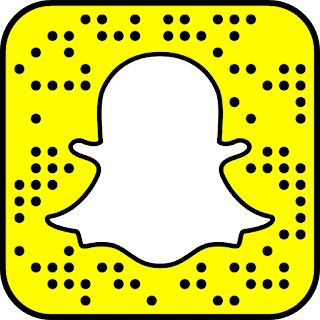 You receive a lot of product, as you only need a very small amount to get your desired effect. Contour #1 has 0.17oz (4.8grams) and the rest of the pans have 0.1oz (2.8grams). Thats a total of 16grams of product and works out to be around $4.30 per gram. 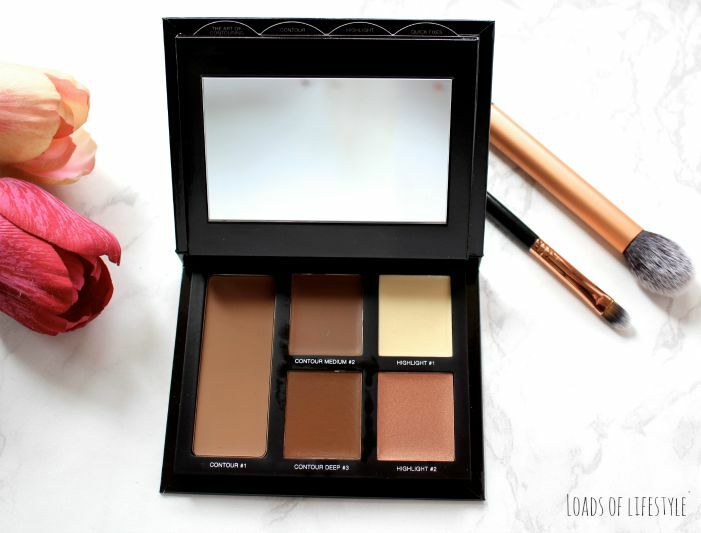 The palette contains 3 neutral coloured contour shades (Contour #1, Contour #2 Medium, Contour #3 Deep) and 2 highlighter shades (Highlight #1 & Highlight #2). 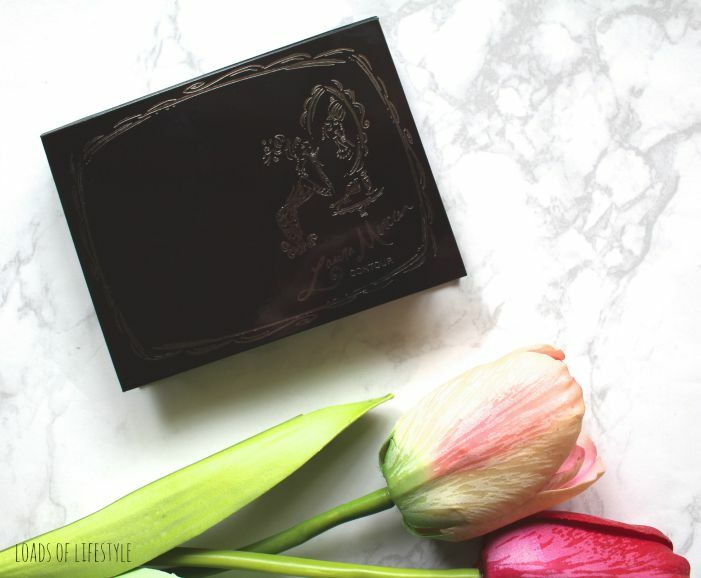 It has a nice sized mirror, and also comes with three handy pull out guides (contouring, highlighting & quick fixes) and a message from Laura Mercier which are stored behind the mirror! The shades themselves are incredibly creamy, and pigmented! You can apply it lightly for a less defined look or go in and deepen it with a different shade of contour or a more heavy hand. 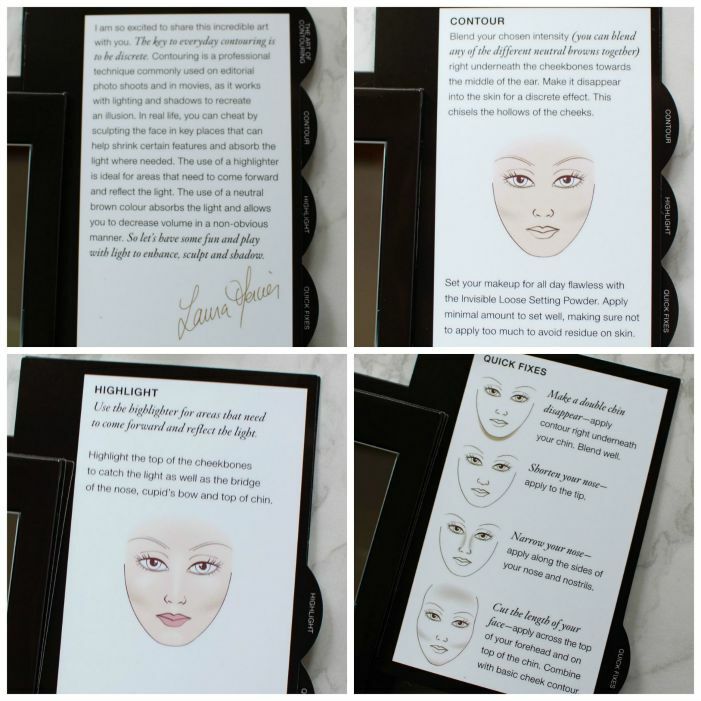 The contour shades are easily blended into the skin, as they warm up with your body temperature. 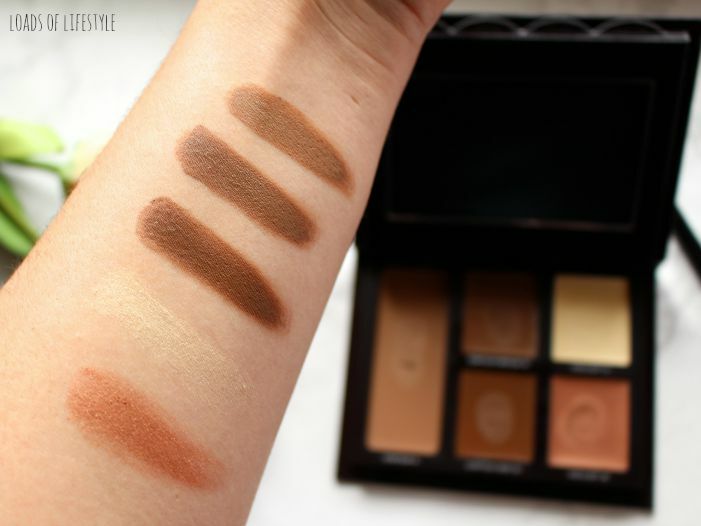 The range of contouring shades in this palette are some of the better I have seen. I believe it caters to all skin tones, with the three different shades. 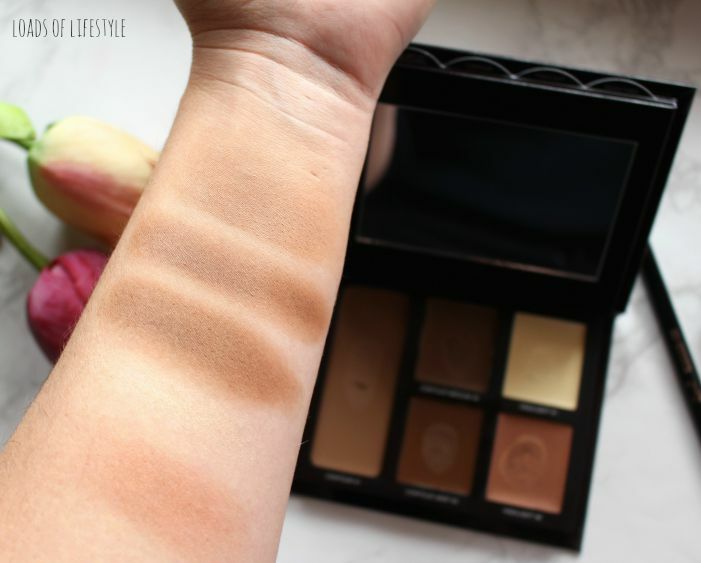 Contour #1 is the lightest (and largest pan size) of the palette, its definitely suited the to majority of skin tones (the palest of pale skin tones would have to use a very light hand). Contour #2 is slightly darker, and would be great for that dramatic contour for going out at night or photography. Contour #3 is quite dark, and will probably the one that gets the least use from me, however its always good to keep your options open - especially for my professional kit. The highlighting shades are a little different from other contour palettes, as they are both shimmery colours. The yellow "banana" shade (highlight #1) is one that you wouldn't use to brighten up the under-eye area but more of a top of the cheek bone, brow bone highlight. Highlight #2 is more of a bronzy-coppery shades that would work well on darker skin tones to highlight, or on paler ones to bronze or even as a blush! I actually think it would make a great cream eyeshadow!! 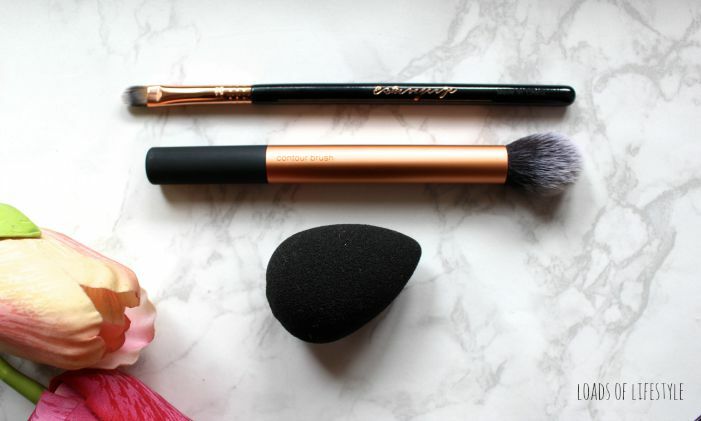 My tools of choice for using this kit are your fingers or the Sigma F70 concealer brush for precise placement of product, the Real Techniques Contour Brush* (from the Core Collection) for buffing and blending in the product and a Beauty Blender Pro for making sure that the product is completely blended into the skin. My tools of choice for cream contouring!! Overall I think this product is great! Its amazing quality, blends easily and is great value for money! I have taken a liking to Laura Mercier products and will definitely be picking up more in the future!! What are your favourite Laura Mercier products? What should I pick up next? Let me know in the comments below!! Also, would you like to see a tutorial on how I contour with this palette?? 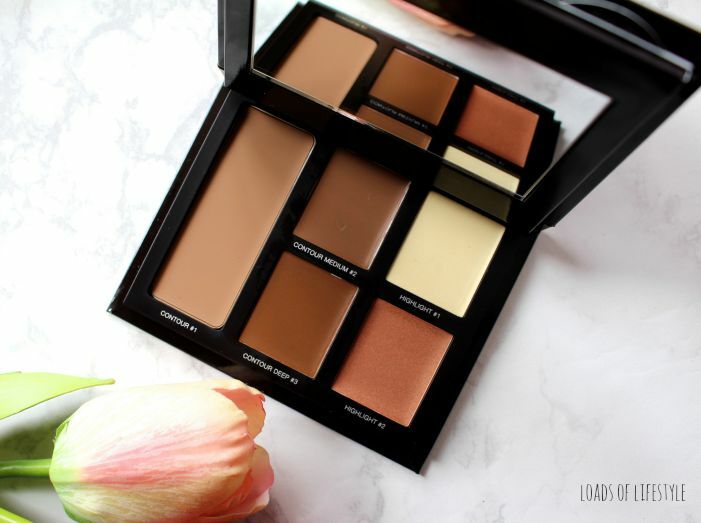 I love Laura Mercier tinted moisturizers, I would love to try this palette out, it looks incredible! The Tinted Moisturisers are next on my LM wish list!! It keeps growing every week!! I am hesitant to try cream contouring because I find it impossible to get creams to stick to my dry skin! The packaging is almost too good to pass up on though haha. Oh thats a shame, I only have the one powder contour kit and its the not so good Australis one.. I definitely need a try a better one!!! The only thing I own from Laura Mercier is the hydrating primer but I don't love it. It's more of a moisturiser on me and doesn't really make my foundation last longer. 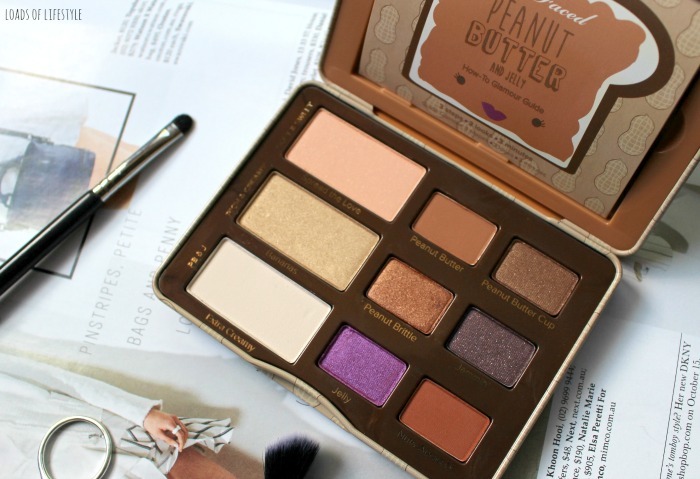 This palette does look amazing though! It's so nice that they shipped it out to you free of charge! I love good customer service like that. Yes you definitely need some LM in your life!!! Do they have a counter in T'ville?